In Germany alone, almost 60% of adults suffer from teeth disease. However, a maximum of 3% of expenditure on dental care is used for periodontal therapies. For over 40-year-olds, even more teeth are lost by gum disease than by caries. As a cause, pPoor oral hygiene and nutrition, a disturbed immune system due to stress, smoking or even genetic systems and metabolic disorders, e.g. diabetes. In addition, it is known today that the germs that cause periodontal disease also treat other general diseases and, e.g. can increase the risk of premature birth. As is the case with caries, good oral hygiene, tooth-nourished nutrition and a healthy lifestyle are the best protection against a whole-body disease.In our oral cavity, there are numerous pathogens and bacteria that are constantly settling on the tooth surface, the gum and the plaque. In only small amounts, these belong to a healthy oral flora. If they multiply themselves by poor oral hygiene, the plaque bacteria form toxins, which migrate into the gums and cause redness and swelling there, called gingivitis (gum disease). If plaque is not removed, it pushes between teeth and the gum. „Bags“ are formed, in which plaque, dentin and bacteria are deposited next to plaque. It is only now called periodontal disease (dental bed disease). 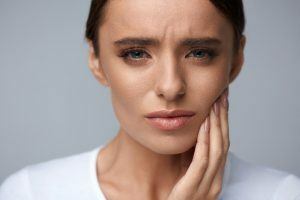 In the advanced stage the inflammation spreads to the jawbone. It is advisable to rinse your mouth with mouthwash concentrate or ready-to-use, alcohol-free mouthwash after brushing your teeth. This irrigation also has an antibacterial effect, where the toothbrush does not come and tightens the gums. In addition, a pleasant feeling of freshness is created. In inflammatory periodontal disease, periodontal spaces are formed between the tooth and surrounding gingival gums. They accumulate deposits which, among other things, contain bacteria which, in turn, propel the pocket formation and simultaneously accumulate on the surface of the tooth and even attack and degrade the bone as the periodontitis progresses.It is not possible to clean the periodontal pockets at home. The deposits contained therein can only be removed by the dentist in the course of a periodontal treatment. Once the bone has been digested, it cannot regenerate again, but it is likely that after successful treatment the gingiva is firmly bonded to the tooth again.A check of the gingival depth is reimbursed every two years by the health insurance company. The dentist measures with a probe how deep the gingival pockets are. In a progressive periodontal disease, the activity of bacteria degrades the bones in which the tooth is anchored, the pockets become deeper and deeper.